The artist of the Baroque era, Jacob Jordaens, during his lifetime, became a highly sought-after art master. He was distinguished by an amazing creative performance – more than 700 canvases remained in the heritage of world culture. Life in Flemish enjoyed the continued interest of the painter, especially the moments of celebrations with the common people. “The Bean King” in 1638 – a picture with an amazing background. A tradition has arisen among the local population – to celebrate a religious holiday in a special way. On the eve of January 6, magnificent feasts gathered here, where the honorable place of the king was played out by the lottery. The king could choose the queen among those present and appoint the rest of the retinue: various ministers and a jester. He was elected chief at a party with the help of a bean, which was put into the dough before dinner – and whoever got the cake with the coveted grain won. Bob was chosen for a reason: he symbolized the guiding star of Bethlehem that led the Magi to Christ. Such a tradition amused and amused ordinary people, and at the same time relieved of tension in relation to the authorities. 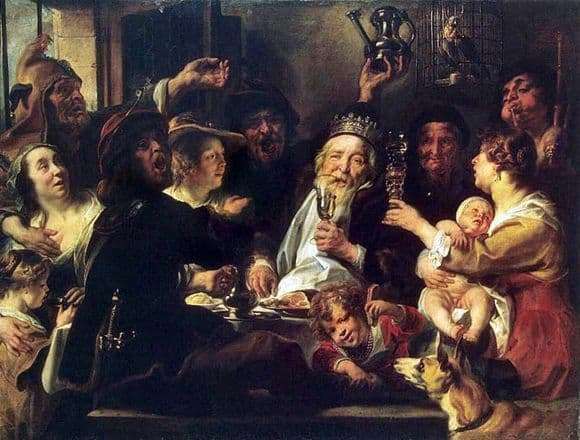 Jordaens writes a moment when the guests are already drunk and, in the rhythm of a single mood, indulge in selfless fun. In the center of the composition is the chosen bean king. He is surrounded by loyal “subjects”: women and men of different ages. The peculiarity of such paintings is the constant presence in the field of view of children and animals. Here, the unity and community of the people: the very elderly lady in the background frowns approvingly and encouragingly; the musician near her was forgotten in a drunken sleeplessness; the seated mother with the baby completely forgot about the rattled baby on her knees; on the left, a middle-aged woman, as if unaware, gives wine to a little daughter. Meal cannons and raised glasses complete the atmosphere of the picture. In a free manner, the painter showed a warm and cheerful scene of the life of compatriots.